Amelia Russo ’11 stands outside the Aspen Art Museum, where she worked for more than four years. Photo courtesy of Russo. The relationship between Colorado College and the Colorado Springs Fine Arts Center has been in the news as CC takes on operations of the 98-year-old institution. The relationship is nothing new: In the past 10 years, an increasing number of CC students have completed internships at the FAC that have afforded them the opportunity to engage in original research, participate in nonprofit administration, curate exhibitions, and learn museum art handling practices. Amelia Russo ’11 interned at the FAC in the spring of her sophomore year while pursuing her art history major and museum studies minor. She worked with Blake Milteer, then the curator of 19th-21st century American art, to prepare interpretation materials to support FAC docents with the exhibition program. But her primary focus, and what she calls an “amazing opportunity,” was working with other CC interns to digitally re-catalogue and translocate the FAC’s Works on Paper collection to a storage facility built during its renovation. “It helped instill in me the importance of object-based work as an art historian. This was a significant lesson that has reminded me to focus on what matters most in my work — the artists, the artworks, and the audience — while not getting too preoccupied with the administrative work that is inherent to museum operations,” Russo emails from Aspen, Colorado. Russo credits CC’s art history professors with pushing her to look further, yet more closely, while studying art and culture. “My time at CC bolstered my natural curiosity and taught me to not shy away from daunting questions like: ‘So what?’ or ‘Who cares?’” she says. Russo also is grateful to CC for developing her writing and research skills. Both came in handy when, after graduation, she worked as a research associate in the education department of the Museum of Fine Arts, Boston. In September 2012, Russo joined the Aspen Art Museum as development assistant and, in June 2013, became the executive coordinator for Executive Director and Chief Curator Heidi Zuckerman. “There was great variety in my duties, and my day-to-day could range from scheduling her calendar, coordinating meetings for the board of trustees, and liaising with exhibiting artists,” she says. As far as Russo is concerned, art will always be integral to her life, studies, and career. The FAC internship has been key to her post-CC success, and she would advise current students to pursue internships in their chosen fields or even another field they might be interested in. “The opportunity to professionally apply what you are learning in the classroom can be extremely impactful on both your current coursework and your future jobs, not to mention that it fosters a synergistic dialogue in your approach and ways of thinking,” Russo says. But once students embark on their internship, they can’t be complacent — she encourages them to soak up every bit of knowledge around them. Rebecca Simpson ’13 interned at the FAC from September 2012 to March 2013 while majoring in art history and minoring in museum studies. While there, she teamed with two other interns and a project manager to work on the collection of Southwestern art and artifacts. They inventoried objects, wrote condition reports, took object identification and condition photographs, re-housed objects for new museum collections standards, and assigned the new numbering system to all of the objects. While at CC, Simpson also interned at the Modern Art Museum of Fort Worth, where she worked in marketing and public relations, and at Cris Worley Fine Arts in Dallas, where she was a gallery intern. “Together the three internships gave me perspective on different realms in the fine art world: working with an art dealer and private collections advisor at Worley, working in PR at a major post-war and contemporary art museum, and, finally, working in collections care and management at the Colorado Springs Fine Arts Center,” Simpson says via email from Arizona. One month after graduating from CC, thanks to networking and distributing her resume, she began working at Phoenix’s Heard Museum. It’s the nation’s largest private museum dedicated to preserving the voices of living Native Americans through exhibitions, programs, and educational initiatives. For the past three years-plus, she’s been part of a team raising funds to support the annual budget, its capital needs, and endowment investments. “I love working with people who are passionate about our mission, the art that we collect, and the artists we work with for our exhibits and programs,” Simpson says. for a short time before moving up to her current position as the associate director of development. “The internship at the Fine Arts Center prepared me with both technical skills of collections care and an introduction to American Indian art. Working with the objects, cataloguing and preparing them for storage, gave me an understanding of the importance of collections care and management,” she says. 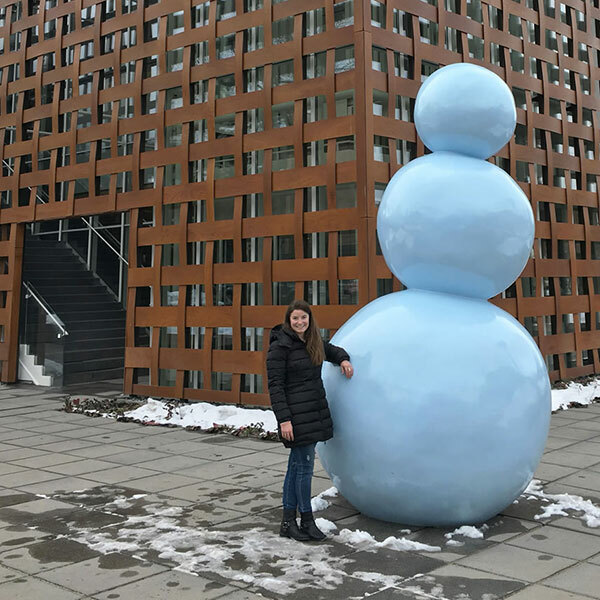 The knowledge Simpson gained during her FAC internship also helps while she works with various museum funders, organization partners, and museum guests. And CC’s Block Plan has given her the confidence to take on projects with quick turnaround times. “Working on a small team with a rather ambitious annual fundraising goal, we will sometimes discover funding opportunities where we must act quickly in pulling together proposals, marketing samples, and/or program outlines that will entice them to support our mission. CC constantly reinforced a resourcefulness in me to be creative and diligent in my work,” she says. Her advice for other potential interns: Get to know staffers in other departments and pick their brains about what they do and how they got there. “There is no such thing as ‘pigeon-holing’ oneself when working at a nonprofit or for a museum. The experience I am getting now in fundraising will be a desired skill perhaps in the future in a more programming-specific role, for example. Everyone needs a basic knowledge of the tenets of fundraising.